Each parent makes different decisions about what games his or her children play and the movies they watch. If you’re worried about your kids making that decision without your input, you might want to investigate the Xbox 360 parental controls. The parental control system blocks access to material rated beyond certain limits by requiring a password. This way, you can watch any movie of any rating yourself and give permission for specific movies or games. Settings apply to the console, not to individual profiles. Restrictions apply to absolutely anyone who uses your Xbox 360 console, including you. You can access any material if you know the code, but you must enter that code every time. If you lose your code, all is not lost. 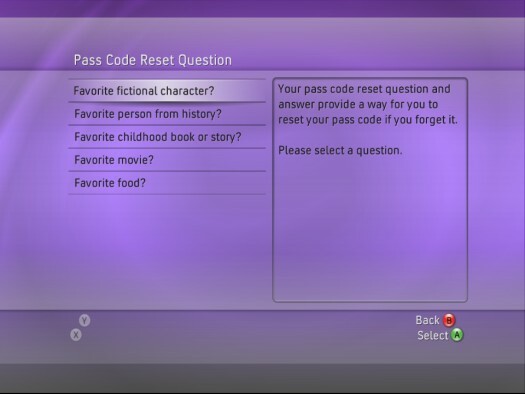 When you set the pass code, you also set a pass code reset question/answer (for example, “What is your favorite color?”). If the parent fails to correctly enter the pass code when trying to enter the Console Settings area, he or she can enter the answer for the reset question to clear and then re-create a new pass code. If the parent forgets the new pass code, too, then he or she can call customer support to get the console-specific reset code that clears the Flash settings. Clearing the pass code doesn’t erase profiles, saved games, downloaded content, or any other vital info. When creating your pass code, don’t pick a pass code reset question that your children know the answer to (like, “What is your pet’s name?”). 1. Open the Xbox Dashboard. If you aren’t already in the Dashboard, you can get to it by starting the Xbox 360 without a game or movie in the DVD drive or by ejecting the current disc. You can also get to the Dashboard by pressing the Xbox Guide button on your controller or remote and then pressing the Y button when the Guide appears. 2. Choose the System blade with the controller. 3. Choose the Family Settings option. 4. Choose the Console Settings option. The console settings apply to the entire Xbox 360, not just a specific user. • You can play any game. • You can watch any movie DVD. • You have access to Xbox Live. • You don’t need a pass code to change any of the settings. 1. Access the Console Settings screen. The preceding section tells you how to access this screen. 2. Choose the Set Pass Code menu option. You’re prompted to enter a four-button pass code, as you can see in Figure 1. 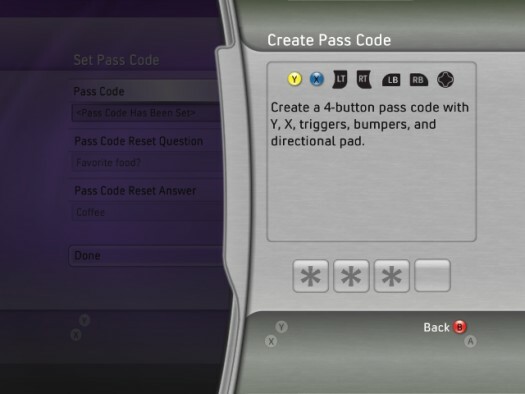 Figure 1: Enter your pass code by using the Xbox controller buttons. 3. Press any Xbox 360 controller button or pull a trigger. 4. Select a pass code reset question and then enter its answer. This question and answer helps you if you ever forget your pass code. See Figure 2. Figure 2: Make your reset question something that you know but your children don’t. If you forget your pass code, you can reset it by using your reset question. Figure 3: Limit all movies at a certain rating and above. The ability to block movies based on their rating depends on that rating being encoded onto the DVD. Most DVDs sold in the United States and Canada are rating-coded, but a particular movie (or a pirated copy of almost any movie) might not have the proper information encoded. A disc without rating information isn’t blocked. Motion Picture Association of America (MPAA) ratings, such as G for General, are used in the United States and Canada. A dialog box from the DVD itself: Says that your DVD player (the Xbox 360) has parental controls running and gives you the option to stop playing the DVD (kicking you out to the Dashboard). An Xbox 360 slide-out dialog box: Appears along the side of the screen and prompts you to enter the pass code. The movie plays normally if you enter the code; otherwise, you end up back at the Dashboard. Game Ratings is the first option on the Console Settings screen. When you select it, a list of ratings appears. 3. Choose the allowed ratings. 4. Press the A button to accept your settings.